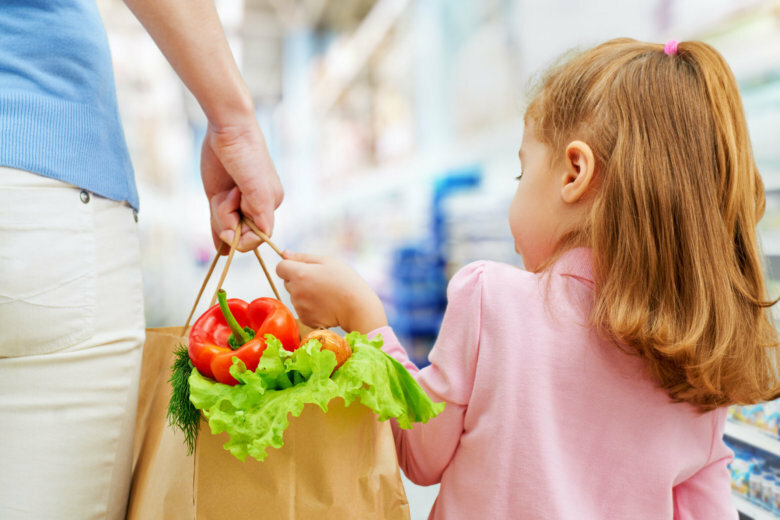 Grocery shopping with kids isn't always stress-free and efficient, but these grocery store games could help teach your kids about food and ease some of the stress. Ever since my kids were big enough to sit up in a grocery cart, they came to the supermarket with me. Sure, it wasn’t always stress-free or efficient (especially when I had three tykes in tow), but neither is taking kids to school — and both activities, in my view, are critical for raising healthy, happy kids and, eventually, adults. To me, the supermarket is a giant classroom in which kids can learn lessons far more important than many they’re taught in school. For example, grocery store “field trips” allowed me to show-and-tell my kids that all foods can fit into a healthy diet, as long as you know how to balance your plate. I also taught them how to compare labels, which foods excel in which areas and how to meal plan — whether that “plan” includes hectic grab-and-go foods or an elaborate dinner. My kids ate it up: My youngest son even came up with the title of my book, “Read It Before You Eat It: Taking You From Label to Table.” And today, although my boys are grown and out from under my roof, they often call me when they shop for food to discuss what they’re buying, cooking and serving to friends and family. To take a play from my “textbook,” start with these grocery store games. While some are better suited for younger children, others can even have an impact on teens. 1. Pick a color or shape. Have your little ones play an “I Spy” type of game in the produce aisle by asking them to pick out colorful foods that are red, green or yellow, for example. Or, have them find foods that are circular, oval or some other shape. This game can be expanded on when you go home — just unpack and use the similarly shaped or colored purchases to create simple recipes your kids can help prepare. Ask your kids to search for foods (especially fruits and veggies) they recognize from books they have at home. That, of course, requires you to keep books at home that have photos of healthy foods. I purposely sought out such books so I could make up fun stories about the produce “characters,” and my kids found it exciting to seek out and taste the foods that seemed familiar. Start a tradition like “Kids Shop Sunday” and let them choose a recipe and create the shopping list for Sunday dinners, even if you just do it once a month. You can also enlist your kids to come up with theme nights for the days of the week — think Meatless Monday, Taco Tuesday or Throwback Thursday. Choose a theme and let your young sous chef play the part, including wearing an apron, oven mitts and even a little chef’s hat. Why wait until Halloween? When your kids aren’t looking, buy a few foods they’ve never had before (think jicama) and that are mild-tasting (like almond butter or sunflower butter instead of peanut butter). With the help of a blindfold back at home, challenge your kids to guess the foods in question by touching, smelling and, ultimately, tasting them. Don’t give them foods you already know they “hate” because they won’t want to play with you, and volunteer to be the one guessing sometimes, too. 5. Conduct a photo shoot. Equip your kid with a camera or phone and ask them to take pictures of individual ingredients in the supermarket. Then, create a dish or follow a simple recipe together and encourage them to take photos of the final feast. With older kids (and their permission, of course), it might even be fun to post the pictures to personal social media platforms and share likes and comments with each other. Once your kids can read, compare food labels to look for sugar and sodium contents or recognizable ingredients. This is truly a life lesson that never gets old, since the thousands of foods in the store are ever-changing. Show your children how some foods are more nutritious than others, and also discuss prices and value. One day your child will be on his or her own, and a budget could play an important role in their purchasing decisions. Here, I’d point out how healthy food doesn’t have to be expensive (hello, frozen veggies!) and how to minimize food waste.